It's been a year and a week since I took in my first group of foster kittens. And now it looks like I have had my last for awhile. Teddy had a little bald patch over one eye that turned out to be ringworm, a cutaneous fungal infection. It's not usually life-threatening, but when you are the ward of a busy shelter system it can be a death sentence because it's highly contagious, very expensive to treat, and can spread to humans who are usually not happy to catch it from a newly adopted pet. Yesterday was a very traumatic day. I took the kittens in to be examined, they kept them for euthenization. And I'm banned from fostering for as much as a year, because they made a mistake and sent a kitten with an obvious lesion home with me. I cleaned out the Nursery one last time, discarding nearly everything and soaking the rest with 10% bleach solution. It's hard to clean when you are crying. Then I took the Nursery sign down and threw it away, too. I have so many things to blog about that I'm not. Blogging. My writing outflow is like a bunch of tangled typewriter keys. Does anyone else remember typewriter keys? So here's the most important thing today: a new group of kittens. 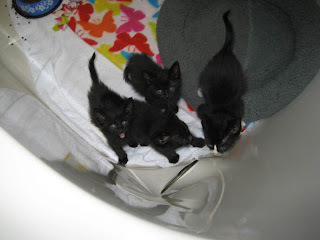 These four are half of a group of 8, and really should still be with their mother. Somehow they ended up dropped off at the shelter without her, though. They weigh 13-15 oz, are the smaller-sized half of the group, and reportedly do know how to eat, but I'll assess that for myself after a little nap. For them, not me. So far they have succeeded in scattering kibble around the tub, but I'm not sure they ingested much. They are splattered with mud, have scrawny limbs and little pot bellies, are known to have had fleas and ear mites (now treated) and probably have worms. But they desperately want hugs, love cuddling, and have huge purrs. They're adorable. And quarantined until the parasites have been eradicated and there are only kittens left. I got to name them, so here you see Betty (female, tux), Hettie (female, black, largest white star and bikini), Teddy (male, black, middle white star and bikini), and Freddy (male, black, tiny white star and bikini, and the biggest mouth). It's nice to be back in the baby business. Last night was my first (ever) voice class. While I did sing in school choruses through 9th grade, I can't remember ever having any physical or technical instruction on how to produce music with the voice. Classes actually started last week, so I jumped right in without any introduction to speak of. While that has the advantage of leaving no time for worrying, I am glad I have some musical background, without which I would have been utterly lost. * Sing arpeggio with continuous zzzz, do - do sol mi do, where first do-do is an octave jump upward. Continuous meaning without discreet jumps to notes, just a continuous motion of tone toward and over them. * Same exercise using the words "I lo-ove to sing." Discussion of centripetal motion. Physical experience of same by swinging arms counterclockwise in large circle to facilitate octave leap. (An exercise involving randomly throwing a stability ball around the group was scrapped because we focused too much on the ball and not enough on what we were singing. Adults. Bah.) The goal was to make that octave leap in a smooth motion, no jerking from one note to the next. We spent some time listening to recordings of vocalists that others had brought (evidently the assignment from last week.) I'm not a big vocal music fan, so it was very interesting to listen to singing as music, the same way I would study a cello recording. It was very exciting to start making connections about how tones become music. You'd think that is such a simple thing, but it's taken me a long time to be able to hear those nuances. * Open vowels, short consonants. Achieve this with very open mouth for vowels (exaggerate) and short closing for consonant. It felt a bit like chewing, and reminded me of one particular choir member in my last church who had a very lovely voice, but always looked like she was chewing the words. However, it was very effective. I found my throat opened considerably when I opened my mouth to sing those vowels, with a remarkable improvement in overall tone. Finally, we ran through the piece for next week, I'm Beginning to See the Light, circa 1944, by the committee of Harry James, Duke Ellington, Johnny Hodges and Don George. New topic entirely. No big vowels. Short notes with swing and lots of bending, overt and implied. My morning practice today was very interesting. I worked on my Bach invention (piano) first, and had intermittent interest from John, Cricket, and my newest foster, Serengeti. But when I started singing every cat in the house was sitting at my feet, watching and listening. Now, I'm not going to speculate on why they are so drawn to me singing, but this is a great piece of music. It just makes me feel happy. Two weeks until the next class, and I can hardly wait. Nothing to do with Africa, just a little addition to my foster crew with a face that calls to mind a tiny and absolutely adorable lion. I think D- feels a little bit sorry for me since she facilitated the adoption of Elle and JJ while we were in Scotland. So Seri is also a new buddy for GiGi, left behind. 08/15/2007 D- picked up kitten found as a stray found in Pine City, MN. 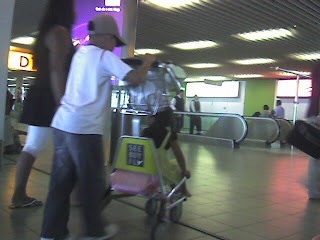 08/16/2007 She was checked out at LAH. She weighed 2.2 lbs. and no sign of fleas, but she had earmites. She was treated with Revolution and her ears were cleaned. 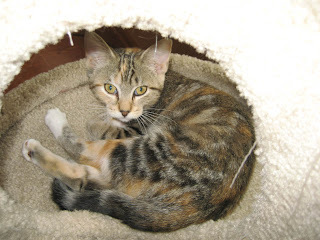 She is a torbie (tabby, tortie with white trim). 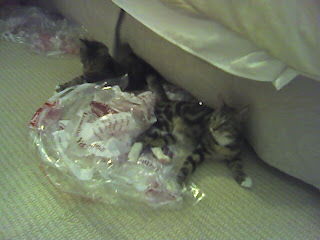 08/23/2007 Seri vomits up stomach full of food and a huge live tapeworm. D- gave her a Cestex pill. 09/06/2007 Second dose of Cestex. 09/11/2007 Spay; Feleuk/FIV test negative. 09/15/2007 Seri is not feeling well after spay; visited vet at Blue Cross Animal Hospital. Got one dose of amoxycillin that day and the next day started 1 ml doses twice a day to be continued for 10 days. She weighs in at 3 1/2 lbs. 09/17/2007 Sera moves to ggp's house for ongoing foster care. 11/9/2007 Well-visit at WPC. Someone's stools tested POS for clostridium and giardia cyst. Ears look good. Viral URI, scant sneezing, mostly conjunctivitis. Oh boy, they feed you well on this train. Far too much to work off when you spend most of the day riding. 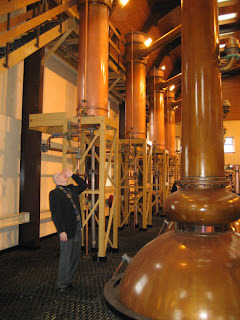 * the stills at Glenmorangie are 17 feet high, the highest in Scotland. * Most of the flavor of the scotch is taken up from the barrels it is aged in. * For the first 3 years, the barrels are used for Bourbon production. * The barrel tops are painted red, and the first lot of Scotch is aged in them for 10 years. * The barrel tops are painted black, and used for a second round of 10 yo Scotch. * 20 yo scotch is produced by taking the 10 yo scotch and aging it for another 10 years in another round of red-labeled barrels. * Special varieties of single malt scotch are made by using barrels that had previously been used to age port or sherry, rather than bourbon. * The Scottish tax on whisky is 67%, due upon its exit from the warehouse. * A very small amount of added water (1/2 tsp/dram) separates the oils and focused the flavor. * You can only by Glenmorangie scotch at the distillery or Heathrow at the moment. Too bad, I thought it tasted pretty good. After an hour's wait in the First Class lounge at Waverly (and our last contact with cyberspace for the foreseeable future), we followed a piper to our train, causing a minor sensation in the train station. What an unusual gaggle of tourists, and why is that piper leading them through the train station? 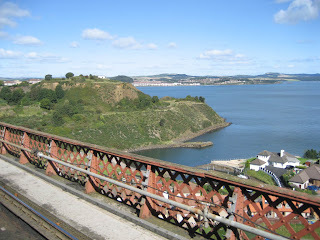 Here you see the view crossing the Firth of Forth train bridge just outside Edinburgh, as we headed up the east coast of Scotland. After tea on the train, the evening festivities included a ceilidh ("kay-lee") at Strathisla (-isla is pronounced "eye-la", as in island), home of one of the distilleries that produces Chivas Regal scotch whisky. We tasted several variants of the local whisky (12 yo, 18 yo, and single malt) and were introduced to a few Scottish dances (the Gay Gordon, Dashing White Sergeant, and Strip the Willow). I am happy to report that I was able to join in the dancing, as long as I didn't try to skip. We gave up on the Dashing White Sergeant quickly as a lost cause, but had quite a good time with Strip the Willow, which I am told is a common way to start a Scottish dancing evening, as everyone dances with everyone and it's a good way to scope out whom you might want to spend time with later in the evening. 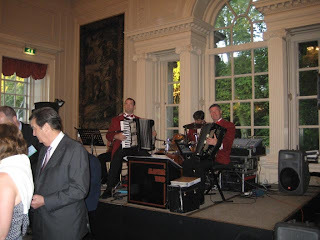 The music was again provided by an accordion, this time accompanied by a snare drum. No fiddlers yet, but rumor has it I may finally hear one tonight. Another highlight of our garden visit was a small, formal garden designed as a memorial to Queen Elizabeth, the late Queen Mother. It included a small house, almost a chapel design, with a large memorial stone. See the nice wallpaper? Surprise! 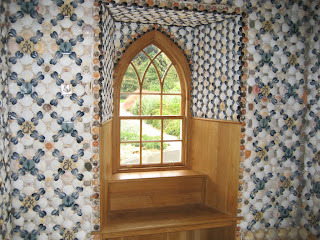 It's not wallpaper at all, but an intricate design of sea shells glued to the walls. And the ceiling was an elaborate arrangement of pine cones. We spent Sunday afternoon hiking to and from, and exploring the Royal Botanical Gardens, about three hours of walking. 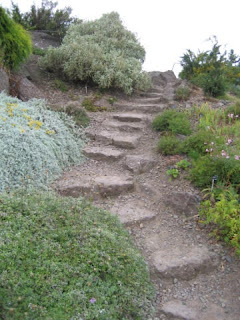 This is from the rock garden, and I am pleased to say that my knee stood up both to the hiking and to climbing up these uneven stairs. Thanks, Dr. N! Wandering the garden turned out to be a very Scottish way to spend the day, even though the weather was the rawest we have experienced yet. It wasn't quite raining, but overcast and very cool. Were we surprised to see the sun pop out again today for the first leg of our train journey through the Highlands. Should be some great scenery to be seen. We depart in about an hour. In case that's the end of my internet access, see you next weekend. I finally found a Scottish fiddler! 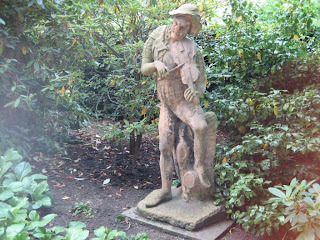 He was in the garden at Holyroodhouse. 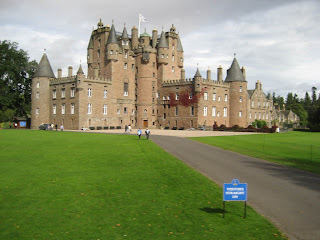 OK, one picture of the castle. In Edinburgh this is referred to in shorthand as "the Palace" in order to differentiate it from Edinburgh Castle, "the Castle." 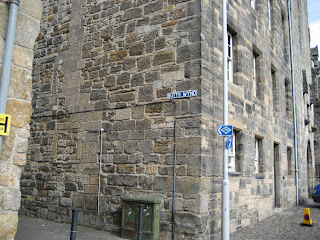 This is the oldest corner, the home of Mary, Queen of Scots when she stayed in Edinburgh. 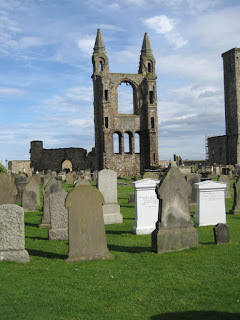 The ruins of the Abbey are to the left in this photo. 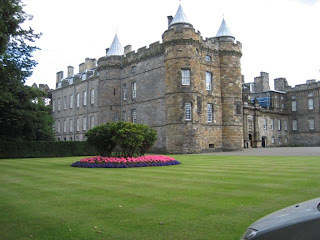 The Palace at Holyroodhouse is the Queen's residence in Edinburgh. "Rood" or "rude" is a cross, and "Holyrood" refers to the True Cross. 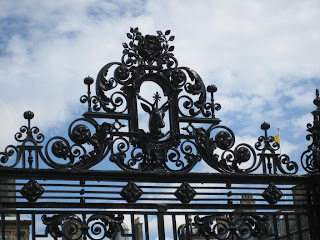 The motif of the stag with a cross between its horns refers to the legend about the initial establishment of the Abbey on these grounds, in which King David I was about to be gored by a stag after a hunting accident. His prayer for deliverance resulted in the appearance of a shining cross between the antlers of the stag, which he grasped and thereby was saved. Regarding Scotish pronunciation, what I notice most is the tendency of all "oo" sounds to be pronounced like the "oo" in "food," with the addition of a little roll of the tongue that gives it some "r" character. So "good" sounds like "gude." When I hear the music of the language being spoken (where I can't actually make out the words), it reminds me of Dutch. 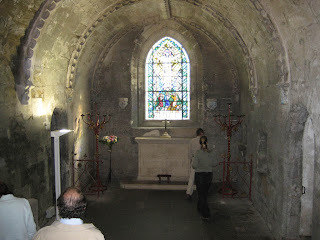 Spent this morning at Rosslyn Chapel, of Da Vinci Code fame, a little break until DH's meetings are finally over, then we are going to hike down the Royal Mile with friends to visit the Palace of Holyrood House, and stop somewhere for dinner. It will be our first dinner out; all of our other meals, such as they were, have been at functions and receptions. It's still sunny and relatively warm, and I'm beginning to hope we do get some rain this week so that I can get a truer picture of what it's usually like here. It's been lovely weather for sight-seeing, though. Again, in the courtyard at Hopetoun House. 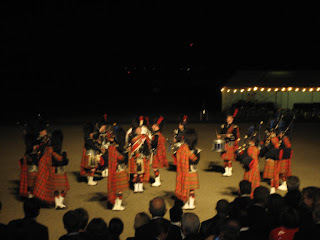 Retreat involves the marching of the pipes and drums onto the field and maneuvering into a circle, to facilitate the playing of several tunes, then regrouping to march off the field after a salute is exchanged between the individual we would identify as the drum major and the presiding official. Taken at the meeting's final soiree at Hopetoun House. Still searching for fiddlers in Scotland. I'm thinking the search may be more fruitful in Appalachia. You know, there are just too many photos of old city scapes and castles in this pile. I love the feeling of walking amongst them, but find the photos pretty monotonous. 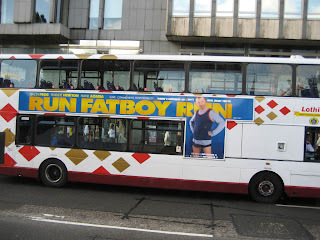 Sparing you a few views, this is the memento from our bus tour around Edinburgh. This is a popular bus poster at the moment, and DH says he is going to take it as his motto when we get home. 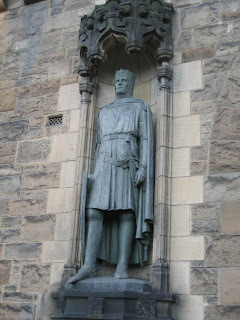 Statue of Robert the Bruce guarding the only easy way in to Edinburgh Castle. I think I do see a family resemblance. Ruins of the cathedral. Too sunny for ghosts, I'm afraid. This is as close as I'll get to golf on this trip, the Old Course at St. Andrew's. Gorgeous day for those who are playing, though. 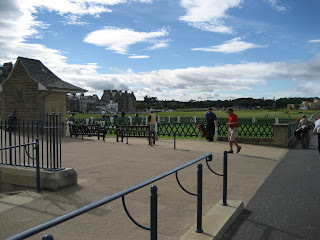 The beach from the training scenes in "Chariots of Fire" is just to the right in this photo. Pronounced "Glawms," where the late Queen Mother grew up, at least partly. There was a cute photo of her playing there as a child in one of the rooms we visited. I finally get the idea that tapestries are used as wallpaper lining the 10-ft thick walls in these castles, covering every inch floor to ceiling. I just keep thinking about the maintenance required, and have great respect for the people who keep these places liveable. Finally a few free moments to enjoy a cup of tea and catch up on blogging. As you can see, DH did eventually succeed in outfitting himself in that kilt. 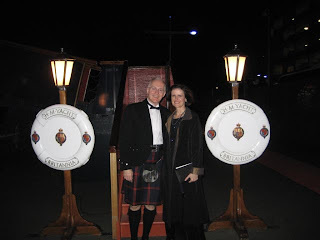 This is at the end of our formal dinner aboard the Royal Yacht Brittania, the Queen's private yacht that was decommissioned in the late 90's. Over 90% of the men were wearing kilts, with the dress of the ladies clearly of secondary importance. That's the Bruce tartan he's wearing, as oral family history puts Robert the Bruce somewhere in the distant ancestral past. I have more pictures to post tomorrow, but wanted to add a quick addendum to my windows post before I call it a night (it's about 11pm here). Last night DH was struggling to outfit himself in a formal kilt, and getting warm with the effort. He went over to open the window, and a few moments struggle rapidly escalated to cursing (well, for him) directed at the window and pleas of help directed at me. The latches were in the locked position. 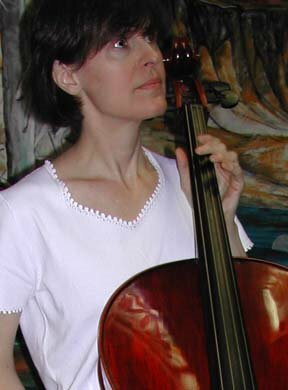 PFS asked in an earlier comment whether I was going to miss my cello during my extended travels. A few years ago I would have packed up my Prakticello and brought it along, and while I would love to have it here the realities of air travel in 2007 plus my need for a larger-than-usual (for me) amount of other luggage meant that it stayed at home for this trip. But I’m not nearly as distressed about that as I might have been then. I know from past breaks that, while I’ll be rusty when I return, in a few weeks at most I will not only have returned to my previous level of playing but may be a bit beyond, thanks to the magic brain development that can happen during a break. As long as I don’t abuse the length or frequency of breaks, I suppose. BTW, John Floeter had an excellent post this week on returning to playing after vacation, good advice for whatever instrument you play. If nothing else, I’ll have the lines audibly down cold, and it will be a fun exercise in coordination. So I guess the answer in a nutshell is that while I can live without my cello for a couple of weeks, I can’t go without practicing for that long! I spent most of yesterday visiting Traquair, the oldest continually occupied house in Scotland. 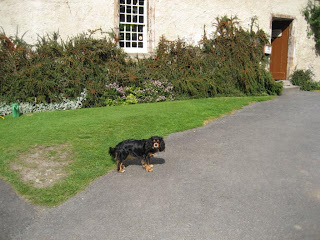 The highlight of my visit was the two resident King Charles' spaniels, a delightful puppy fix. It boggles the mind to think that a house has been lived in for almost 1000 years, and this one is noteable in that for most of that time it was by two branches of one family. Pretty cool to have the ancestors looking down from their portraits during lunch. One family story involved an escape from the Tower of London, in which the wife visited daily with a servant wearing a hooded cloak, and one day had the servant switch places with the imprisoned husband. The story includes the wife's return later to extricate the servant, but I wonder if that isn't a modern fabrication to make us feel less badly about the servant's sacrifice. I found myself awake at 2am, wondering whether that story wasn't the inspiration for Barty Crouch, Jr's escape from Azkahban. 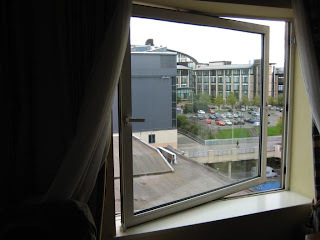 It's very nice to have a working window on the upper floor of the hotel. We've had a little trouble convincing the loo to flush properly, and the, ahem, ventilation is much appreciated. Edinburgh is surprisingly quiet at night, apparent while sleeping with the window open. It did take us more than the expected number of minutes to figure out how to open it. 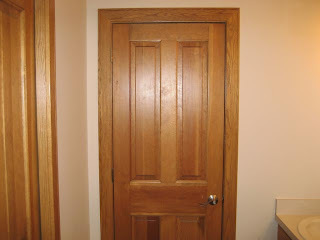 There are latches at each side, about two-thirds way up, and we expected it to tilt in or out from the top or bottom. Instead, it swivels around the center, and requires coordinated pushing and pulling from the appropriate sides to open. I love the small differences in the common things of life, so that provided a few minutes entertainment, frustrating though it was. 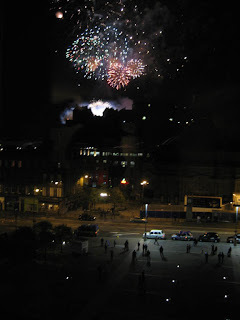 Our first night in Edinburgh happened to be the last night of the Festival, and after an afternoon power nap and a little walk to familiarize ourselves with the local area we were treated to a display of fireworks over Edinburgh Castle. Who knew that our hotel would be ideally situated to enjoy the pyrotechnics? The display was choreographed to the orchestra, which we had playing on the radio while we watched. Rumor has it that there were 100,000 units (what do you call individual fireworks?) set off, an impressive display, The streets were blocked off in all directions, and in the lull in the usual city traffic the cabs pulled over to the curb to take in the finale. Today the sun is out and the breeze has abated, and it looks like it's going to be a fine day. 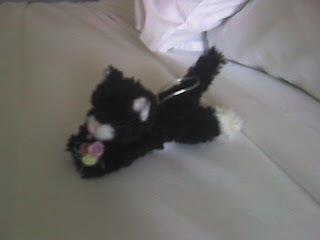 D- loaned me this tiny tuxedo travel buddy so I wouldn't have to sleep in a catless hotel room. He's about 4 inches long, and adorable. She didn't tell me his name, so for the duration of this trip he is answering to Tim Gunn. All of that angst over packing, or not packing, and I find that I'm in the usual position of having a few articles that will do and a whole bunch of things that won't. Things I didn't expect: uneven foot surfaces beyond the ubiquitous cobblestones and a steady wind. I know it's partly the fatigue, but I'm freezing. However, I'm *not* going shopping for anymore clothes. With T.G. as my inspiration, I'm just going to "make it work." 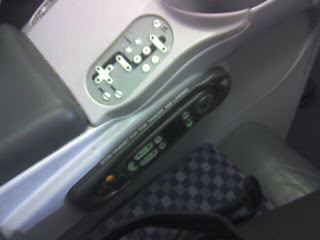 I've got 8 or 9 hours to figure out how this seat works, and I'm not sure that is enough. The news of the hour is that a young couple visited my littles this evening (D- was their tour guide) and were quite smitten with Miss Elle. Who wouldn't be? It's been famine all summer, but this was the second visit this week. The first, a vocal music major at the U, chose Lizzie, whom you might remember from her play date a few weeks ago, and Dale, a "chipmunk" at D-'s house. This couple is thinking that Simon, another "chipmunk," might be a good surrogate brother for Elle. Ouch, I'm missing her already. Up and down, and up and down and up and down to go. 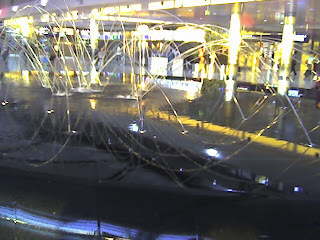 There's an interesting water sculpture in the Detroit AIrport. It's a 30 or 40 foot diameter raised table of black granite. Water arcs out of dispersed spigots, flush with the table surface, forming patterns of arches suggesting architectural features one moment, diving porpoises the next. As with many live performances, a photograph doesn't do it justice. Especially one from a mobile phone! 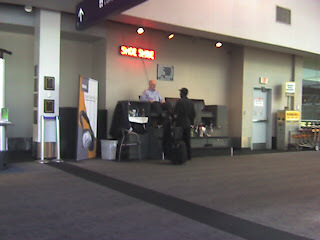 Do you find shoe shine stands anywhere besides airports these days? It's Saturday afternoon, there was no line at security, but we had to be at the airport hours ahead of time for international travel. Changed some dollars to pounds, made sure DH has the spiffiest-looking shoes on the plane, then we're off to find someplace to twiddle our thumbs and practice sitting.